Application: 1 Kraftform Kompakt Vario RA bit-holding screwdriver. A resistant plastic is used for the core which ensures that the blade is held securely, even under high strain. The hexagon design of the directional switch made out of robust die-cast zinc ensures that the ratchet screwdrivers do not unintentionally roll away at the workplace. A softer material is used for the coloured soft zones, which has a high frictional resistance and allows the transfer of high forces - thus requiring less screwdriving effort. The black sections with their hard surfaces prevent any "sticking" of the hand to the handle, making rapid repositioning of the hand possible. The 05002900001 Wera Kraftform Kompakt 80 Vario Handle is one of thousands of quality tooling products available from MRO Tools. Please browse Wera Kraftform Kompakt and VDE Tools for tools similar to the 05002900001 Wera Kraftform Kompakt 80 Vario Handle. 05002900001 Wera Kraftform Kompakt 80 Vario Handle description summary: Wera Kraftform Kompakt 80 Vario Handle. A resistant plastic is used for the core which ensures that the blade is held securely, even under high strain. The hexagon design of the directional switch made out of robust die-cast zinc. 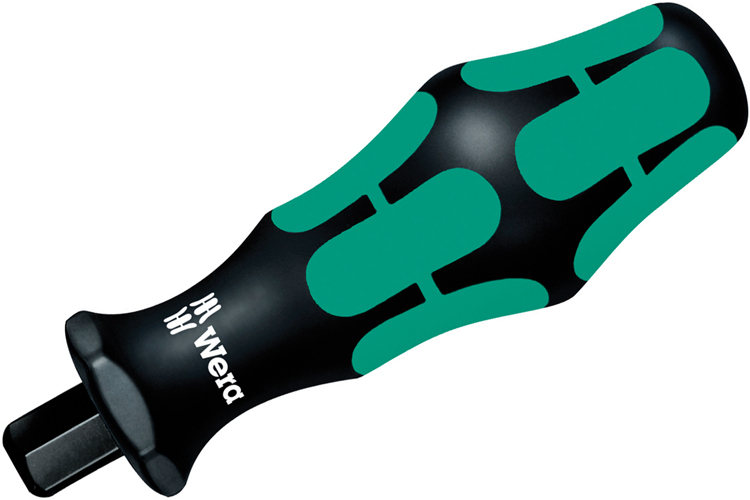 Quantity discounts may be available for the 05002900001 Wera Kraftform Kompakt 80 Vario Handle. Please contact MRO Tools for details.